Strong Vincent was born at Waterford, Erie County, Pennsylvania, 17 June 1837. He graduated from Harvard, Class of 1859, and practiced law in Erie, PA. In 1861, Vincent enlisted for 3 months in Col. John McLane's Regiment of Erie Volunteers, and was mustered out with the regiment in July 1861. He was mustered into the U. S. Army on 14 September 1861, as Lt. Col. of the 83d Pennnsylvania Volunteers. 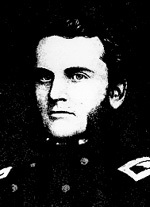 When the regiment commander, Col. McLane, was killed at Gaines' Mills on 27 June 1862, Vincent was promoted to colonel. Eventually, as senior colonel, he was given command of the 3d Brigade, consisting of the 16th Michigan, 44th New York, 83d Pennsylvania, and 20th Maine when George Sykes was given command of V Corps after George Meade was appointed Commander of the Army. Vincent placed his brigade, in the above order from north to south around, and just below, the summit of Little Round Top, taking special care to ensure that the 83d PA and 44th NY were side-by-side. It was brigade tradition that these two units, sometimes called "Butterfield's Twins," fight next to one another (see map). During the Confederate assault of the hill from Devil's Den, Vincent rushed to the right of his lines to rally the troops of the 16th MI, then heavily engaged with the 4th and 5th TX. It was there that he received a mortal wound. For his gallantry, Meade, telegraphed President Abraham Lincoln on 2 July asking that he be promoted to Brigader General, which was granted. He died of his wounds on 7 July, and is buried, with his wife and daughter, in Erie Cemetery, Erie, PA.
Ref: Norton, O. W. The Attack and Defense of Little Round Top. Chicago, 1909.